In May 2016 the high court in Johannesburg decided that a class action lawsuit could be laid against 32 gold mining companies in South Africa. Three law firms presented the case on behalf of a group of miners who represented all miners suffering from silicosis and pulmonary tuberculosis (TB), as a result of working in the gold mines. Silicosis is a preventable but incurable lung disease that is contracted in the gold mines through inadequate protection from silica dust. Miners who contract silicosis get tired and out of breath quickly. They are prone to lung infections, respiratory failure and TB. Many miners started working in gold mines, hundreds of miles away from their homes, when they were around 16 years old. They learnt the skills they needed on the job, having been denied a formal education during apartheid; they were mostly black, poor and from rural areas. After 30 years the work made them sick and they were sent home with little or no compensation, no transferable skills, and with a sickness that made it almost impossible for them to continue working. The burden on the household was huge and the responsibility for providing for the family was usually passed on to the wife or children. 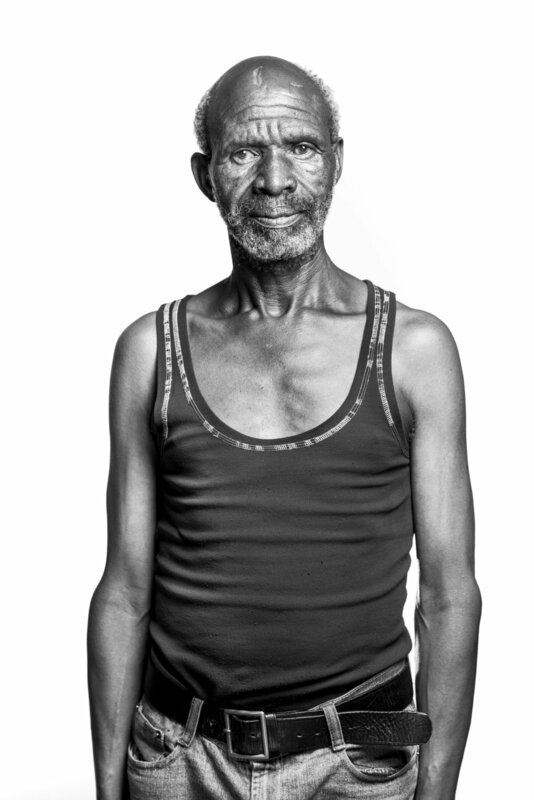 Over a period of 20 days, in September and October 2015, I travelled around South Africa's Eastern Cape, into Lesotho and up to Johannesburg to find and photograph the 56 miners and widows named in the court documents. In early 2015 I was sent a newspaper article by my close friend and environmental expert Nadia Sitas. It was a piece written by Dean Peacock, Anele Yawa & Emily Keehn about Silicosis and the upcoming court case. Nadia suggested that it could be a really interesting issue for a photographic project so I contacted the writers and asked if they could help me to make an initial project about silicosis. They were enthusiastic about the idea and, with their financial support for travel, I made a short photographic series that was featured in the Mail & Guardian. After this short project was published I was approached by a coalition of NGO's wanting to create a larger project to be used as advocacy around the court case in October. The project was made in collaboration with Section 27, the Treatment Action Campaign and Sonke Gender Justice. Specifically I need to give credit to Anso Thom and Lotti Rutter who conceptualised the idea with me over a cup of coffee in Cape Town. We wanted to give a voice to those who were going to be talked about in the courtrooms of Johannesburg, miles away from their own reality. 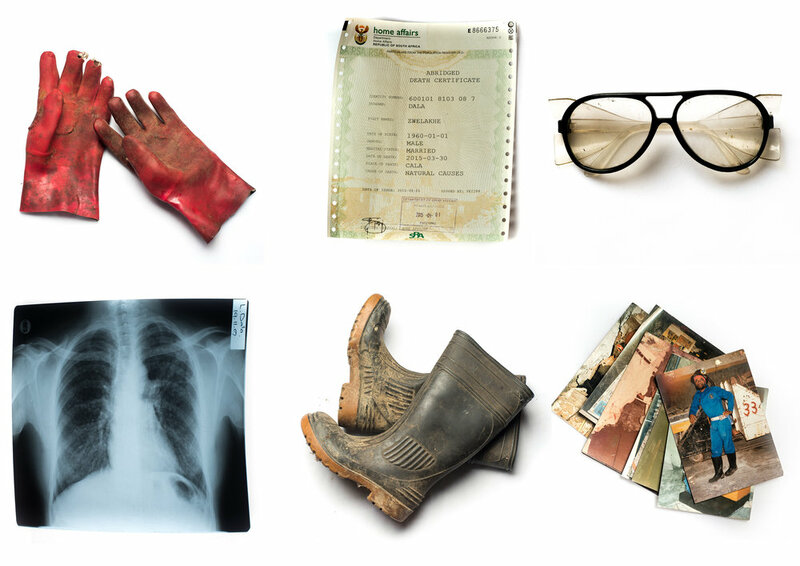 We wanted to make the subject of silicosis understandable and accessible to a wider audience, to give the public an opportunity to empathise with the victims and question the morals of the powerful mining companies that exploited them. The story was about more than just injustice, it was about family and livelihoods; the understanding of a shared humanity. Once the funding was in place and I was given the go ahead for the project I set about making travel and logistical preparations. There were 23 days to go until the court case began and I needed to find 56 people, mostly living in deeply rural areas of a very large country. I had a list of the miners who were named in the court documents, and was grateful for the help of the participating law firms who gave me contact details for each person. Three law firms were involved with the court case; Richard Spoor, Abrahams Kiewitz and the Legal Resource Centre (LRC); each one of them providing me with local contacts to employ as translators and fixers along the way. On the 15th September 2015 I set off for Port Elizabeth with a list of contact numbers and some rough locations for where I might find the miners. I had a route planned, a bag full of equipment and a blind hope that I could pull off this mammoth task. Every project needs parameters, walls around it that give a structure and let you know what you are doing and, more importantly, when you are done. This project was simple: a list of 56 miners, that's it, photograph them all. One thing I realised very early on was that the distances that I would have to cover by car were much further than I imagined. Two people could technically live in the same municipality, but their homes could be hours apart, the vast rural countryside and dirt tracks contributing towards a long and arduous road trip. I drove the entire journey myself, it would have been too much to expect my assistants/translators to take responsibility for driving and navigation. This meant that the days started at 5am and we arrived at our evenings accommodation anytime between 8 and 10. If I was lucky I photographed three people in a day, if I was unlucky it was only one. I spent no less than 2 hours in total with each person. Every night I edited the photographs, wrote blog posts, backed up my memory cards and compiled the interviews and GoPro footage. This meant that I was working a 19 hour day, on average, with 5 hours sleep a night before we had to get up and start all over again. Navigation was tricky as most of the people we were trying to locate did not have a house address and there were no road signs or place names. Usually we would have the name of the village that they lived in, or near, and the municipality that the village came under, coupled with vague instructions from the subject about how to find them once we got there. In order to find people we would drive towards the municipality and then ask for the village. We would be given directions using two locating devices - Schools and Clinics. Once we had located the clinic or school that we had been pointed towards, we would ask again and be directed to the next facility, the process continuing until we arrived in the village. For those that care, a gear list is below. I had the luxury of a car for the whole trip but to get to the starting point I had to fly in a small plane, so I was a limited with what I could take. Regardless, my camera and lights served me well, along with a collapsible backdrop that saved me a great deal of time. Nikon D800, Nikon 50mm f1.4, Nikon 85mm f.18, Sigma 35mm F1.4, Profoto B1 strobe light, Profoto Air Remote, Fuji X100T (spare camera), Nikon SB900 & SB700(spare lights), Pocket Wizard triggers (for spare flash), GoPro Hero 4, Sony MDR 7506 headphones, Backup hard drives, Passport, Zoom recorder, ND filters, Leatherman, Passport, Aeropress coffee maker and Terbadour coffee. Not shown here - Lastolite collapsible background and various light shapers; softboxes, umbrellas and octoboxes. I needed to make imagery that would force the public to sit up and take notice. I wanted to show each person in their space, in as much detail as possible, lighting the scene so that nothing got lost; so that each person was seen, related to and understood. For every subject I created video interviews, portraits on white and black backdrops, still life images and environmental portraits. Many of them had tools, documents or photographs which I photographed on a white background, to abstract them from the chaos of the household. We took the time to explain in detail what we were doing, informed consent being vital to the process, ensuring that each subject knew that being part of the project came with no guarantees of compensation, all we could do was raise awareness of the court case. Time was always scarce. Ideally I would have given myself at least a day in each location to find the best background for the portrait and to wait for the best available light. As with much of my work, I found myself in places that I did not know, having to trust that, with my skills and experience, I could make the best out of what was available at the time and location. I always take time to explain a project to the people I am photographing, and often find that, if they understand what I am doing, and agree with my reasons for doing it, they will give me what I need without me having to give much instruction. Nobody smiled for the portraits, because they knew that the subject was serious. The expressions that you see are not forced, they are natural and real, a visual manifestation of the inner contemplation of the injustice that they felt. I shot mostly inside because the interiors were so interesting and made for very eye catching imagery. A persons possessions can really tell a story about them and humanise them to an audience. Anything that we see in an image that we share with the subject, a stove or a television for example, can add a subconscious level of connection; essential in building empathy between a viewer and the subject. Interiors were easy to light, I just put up as big a light as possible and crammed myself in to a corner. I used the same camera and lens combination for all of the environmental portraits (Nikon D800 with a Sigma 35mm f1.4 art lens). The outside shots were taken either when the landscape seemed important to the subjects lifestyle or, when the inside of their home did not seem usable as a backdrop. The midday sun was my biggest enemy when shooting outside and choices had to be made to overcome that, it wasn't an option to leave with a badly lit portrait! I had purchased the Profoto B1 because of it's power, durability and portable size which together with the 1/250 sync speed of the D800 allowed me to position the subject and overpower the sunlight enough to shoot at almost any time of day. After the main project was finished I visited the National Institute of Occupational Health, to talk with them about the project and ask for advice. In their offices I found shelves of jars containing cross sections of diseased lungs, cataloging various occupational health issues. I photographed them all using a black velvet backdrop, lighting them from the sides to avoid reflections. These still life images are not easy to look at. They highlight the gravity of the situation and force us to remember the physicality of illness. These images have not been used yet but I hope that they will not be out of place in a larger retrospective of the project. The portraits were exhibited in the basement of the Central Methodist Church in Johannesburg, across the road from the high court, during the court proceedings. Lawyers from both sides, along with press and public, were given miners helmets with torches and invited to walk around the tunnels constructed from large portraits of each of the 56 miners. A soundscape of field recordings of the miners wheezing accompanied the exhibition and created an overwhelming sensory experience that brought several people to tears. A BBC report containing footage from the exhibition can be seen here. At the exhibition we gave away free books, expertly and swiftly designed by Karien van der Westhuizen at The Earth Is Round. The books of the series featured all of the portraits and stories of the miners, an important part of the advocacy being that the message needed to be taken away and distributed further. The book made its way to the judges who were particularly affected by it, so much so that they are currently hoping to curate a permanent exhibition of the work at the constitutional court. Halfway through the making of the project there started to be some interest in what I was doing. I was contacted by radio stations and took interviews as I was on the road. The Guardian were excited about the project and were keen to publish it, doing so at the time of the court proceedings. The exhibition brought a lot of attention and I was suddenly overwhelmed with requests for publication in local and international media. The response from the public was very positive and it really felt that the project had gone a long way to raising awareness of the issue and facilitating engagement from a media saturated public. At the end of 2015, I partnered with the Treatment Action Campaign and Section 27 to move the exhibition to the Iziko Slave Lodge in Cape Town where it stayed for 3 months. In 2016 the series was awarded the CAP prize for contemporary African photography as well as the PDN storytellers award as well as being selected for the lensculture storytelling award. Most recently, the portraits have been on display in Sydney, Australia as a featured exhibition in the Head On Photo Festival. The exhibition was organised in partnership with the Australian Institute of Human Rights who were kind enough to fly me out to Sydney and organise an event to discuss the work. This took place on the night that the compensation settlement was announced in South Africa. I will discuss this event in greater length in a separate post. Most notable were the conversations the project started. Silicosis can be a dry subject, easy to gloss over. In the melee of international news, The Price of Gold provided a visual point of engagement in an often overwhelming sea of words. So many people were involved in the making of this project, not least all of the miners, their widows and families who graciously allowed me into their homes and had the patience to listen to my ideas and add their voice to the project. My assistants; Ziyanda Manjati, Asanda Mbolekwa, Mpai Nompi and Shafiq Isaacs were indispensable and worked tirelessly to locate and communicate with each of the miners. Other people to that I cannot go without thanking are Nadia Sitas for the initial idea for the project, Richard Spoor, Georgina Jephson, Patrick Schultz, Charles Abrahams, Anso Thom, Lotti Rutter, Marcus Low, Karien van der Westhuizen, Nomatter Ndebele, Ngqabutho Mpofu, Mark Heywood, Mary-Jane Matsolo, Sayi Nindi, Dean Peacock, Beth Goldblatt, Shirin Rai, Andrea Durbach, Denise Miles, Steph Manefield, Gabrielle Dunlevy, Louise Chapell and many more.